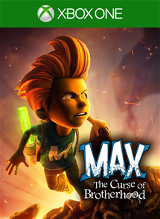 Max: The Curse of Brotherhood is a 2.5D sidescrolling puzzle platformer developed by Press Play, a company owned by Microsoft. It’s a sequel to the Wii and PC game Max & The Magic Marker, which was released in 2010 before Microsoft bought Press Play. Max: The Curse of Brotherhood is developed my Microsoft Studios and is a part of their indie game push along with ID@Xbox. You play as Max, who found a curse online that sent his annoying younger brother Felix through a portal to a monster infested magical world which Max instantly jumps in after him. This world is being controlled by the evil lord Mustachio. Mustachio plans to use Felix’s youth and some evil magic to allow him to go back to being a young man and continue to reign over the land before his old age catches up to him. It’s up to Max to save Felix and save the day. 2D/2.5D puzzle platformer games have become one of the most common genres in gaming. So each entry needs to have its own unique puzzle and gameplay elements. In Max this comes to fruition with the magic marker; an item found early in the game that builds in power and abilities in each new world. Max: The Curse of Brotherhood, along with Halo Spartan Assault, was the first game to be utilized with the Games with Gold program for the Xbox One, which allows Xbox Gold users to download and own games for free. Max’s story is very simplistic and predictable; it plays out like a kids Disney or DreamWorks movie. Honestly this isn’t necessarily a bad thing, there’s no reason at all to have some crazy story because at its core Max is a kids game that us adults can also enjoy. There are really only four characters in the game. Max, with his motivation to right his wrongs and save his obnoxious brother Felix, is a good enough protagonist. Felix’s voice is one of the more unbearable things I’ve heard in gaming. I guess this is a good thing, because they try to make Felix be that annoying little brother character from every movie and TV show ever so they do a nice job, but jeez is he irritating. On one of later levels you can hear his cry for help every five seconds and he repeats the same three or four phrases over and over and over and I almost didn’t want to save him. Mustachio is just a crazy evil bad guy, nothing special really, other than the fact that he is incredible ugly and disturbing. And there’s a fourth character, a creepy old lady who has no name but gives Max his magic marker and aids him throughout the journey. There are seven chapters with two to six levels in each chapter for a total of twenty-two levels. Each chapter is atheistically very different, varying from anything from a desert to a forest to a dark rivery wasteland. The level design offers some diversity. Usually you can walk at your own pace to navigate the puzzles and platforms and avoid the enemies. Sometimes however you’ll get chased by a giant monster, ride a log down some rapids, run from some rising lava, etc. Nothing in this aspect is revolutionary, it’s all been down before, but it still offers some appreciated array of level design. The real special part of the gameplay is the magic marker. And this is where you make your bread and butter in this genre. The gameplay needs to be fun and the puzzles need to utilize the games twist properly. In Portal this is the portal gun, in Braid it’s the time bending, in Fez it’s the world manipulation. While Max doesn’t use its magic marker anywhere near as creatively and perfectly as those games, it still does a fine job of creating rewarding puzzles and gameplay. When traversing the world there are predetermined spots around the environment that you can manipulate using the marker. The key in these moments isn’t’ to necessarily find these locations, although sometimes they are slightly hidden, instead it’s about properly using them to climb over a giant rock, smash open a gate, take down a monster, etc. To move max you use the left analog stick, and to control you marker you use the right stick. As soon as you create something with the magic marker you can destroy it with a click of a button. This can be used to start over if you messed up something, but it’s also used to solve puzzles. The abilities you unlock for the magic marker allows for continual fresh and interesting gameplay. The first thing the magic marker can do is raise pillars out of the ground. This is the most simplistic power of the marker, but it is still used in intriguing ways. Sometimes it’s used to block a monster, or maybe to simply climb onto a ledge, or sometimes it’s used to create platforms for rolling rocks to fall down and smash into giant stone walls. You soon learn to create vines to use to swing over giant pits, but again they find creative ways to go beyond what you expect like attaching the vine to a giant boulder and pushing it off a ledge then quickly breaking the vine and watching it fly through the air and smash into a monster. They continue with this throughout the game, always using the abilities in ways you wouldn’t expect. Later in the game you gain the ability to create branches, water spouts, and launch fire through the air. I was pleasantly surprised by the range of usages for the magical abilities of the magic marker. Each one could have easily been a simple one trick pony, but that thankfully isn’t the case. The game’s puzzles are at their absolute best when you are asked to use multiple abilities in one puzzle. They do this pretty often and usually they are done well. The final boss battle is weak. It’s actually a strange and doesn’t feel well. In a puzzle based platformer it’s hard to do boss battles well. Putting any kind of direct combat or even puzzle based combat into the game feels forced, but I don’t blame them because no matter what it’s hard to pull off. Max also has hidden collectables to find that can provide a decent challenge at times. The graphics in Max are sub-par. The first chapter of the game takes place in the dessert and it’s the ugliest chapter in the game. It seems strange to start off with such a bland boring environment. The next chapter looks better, it’s a forested area. But the darker the game get’s the prettier it gets. There is a strange swampy rivery chapter that is very pretty; the art design is fantastic here. And when lava get’s thrown into the mix in dark dungeons in the later chapters it is also visually appealing. On a technical level the game is not impressive, but at some places the art design picks up for the lack in power. There is little detail and not much enemy verity. At some point the game is flat out ugly. There are objects that are used repetitively throughout the environment. This is done in games often, but if you use that same rock in or tree stump in nearly every level than there are tricks that can be used to make them look slightly different. I also encountered strange visual glitches from time to time that threw me out of the experience. The voice acting is aggravating to the ears, and the writing is equally dreadful. The music is also lacking, sounding like it got ripped right out of a straight to dvd soundtrack. Overall the general presentation of the game seems very rushed. More time to work on detail in the environments and overall appearance would have greatly enhanced on Max’s overall feel and tone, which would in turn improve the overall game itself. Max: The Curse of Brotherhood is a good start to Press Play’s development on the Xbox One. It’s by far not a perfect puzzle platformer, but it does make the most of the magic marker and creates fun gameplay. The puzzles could have been much tougher, there were very few moments where I truly had to stop and think, but as mentioned before this game is designed partially for a younger audience. Max could have used more time in development. The core game is there, but the polish is not. It’s not the prettiest thing to look. I’m a big proponent of game “feel”. A game’s graphics, art, music, story, and characters can create a tone that pulls you in like no other medium in entertainment. The best games are the ones that create incredible game feel and tone. Bioshock, Limbo, Arkham Asylum are games of the last generation that did this perfectly. Games from the last year that created phenomenal game feel are Child of Light, Last of Us, and Valiant Hearts. Max really doesn’t do this at all, there’s no game feel and no purpose of the direction of the game. More focus and time could have propelled Max to greater heights. Not all of the puzzles themselves hit home, this isn’t the same level as the aforementioned Portal, Braid, etc. but it’s a solid inaugural effort for Press Play on the Xbox One. I look forward to Press Play continuing their efforts on their new home for Microsoft, and I look forward to the possibility of more Max games in the future. Press Play has things to learn but they are on the right way, and that’s definitely a good thing for us gamers.